A Farm-To-Table Delicacy From Spain: Roasted Baby Pig : The Salt Cochinillo asado has appeared in literature throughout history, from Cervantes to Hemingway. The prized piglets featured in the dish are slaughtered after about a month, when they still weigh less than 10 pounds. 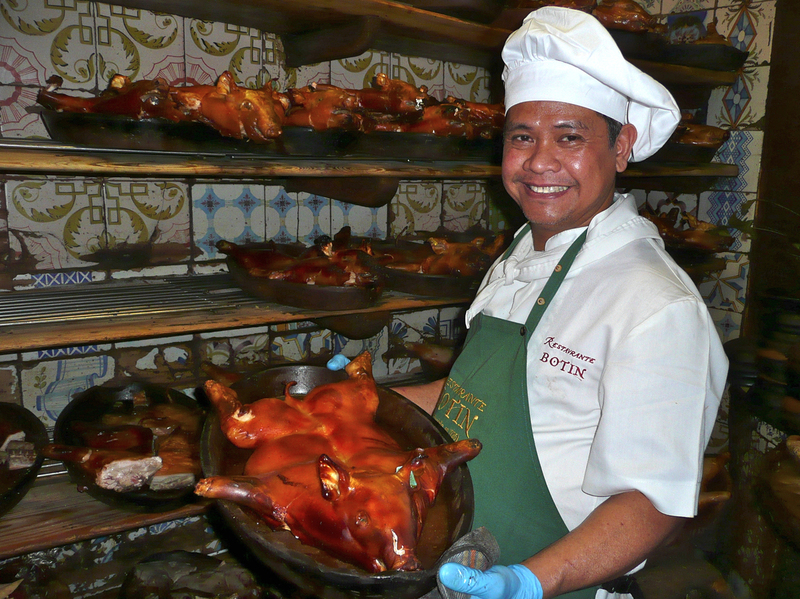 Roel Basalm Alim, a cook at Restaurante BotÃ­n, displays a plate of cochinillo asado, or roast suckling pig. On the windswept plateau where Madrid is perched, it's too dry to raise cattle and most crops. So pork has long been a mainstay, from jamón ibérico and charcuterie tapas to stews of pigs' ears and entrails. But when locals want a really special treat, they go for an entire piglet roasted whole — head, hooves and all — on an oak wood fire. Cochinillo asado, or roast suckling pig, is part of a tradition of farm-to-table eating that's appeared in literature, from Cervantes to Hemingway, for centuries. The pigs have typically been raised on family farms in the Spanish provinces within about 100 miles from Madrid. They're fed only their mothers' milk and are slaughtered at the age of 4 to 5 weeks before being transported to restaurants in the capital. In olden days, that was at least a day's ride on horseback. Now it takes a couple hours by truck. "A baby piglet is very delicate. Any bacteria or parasite could hurt them," says Victor Manuel, whose family runs Carnicas Tejedor, a cochinillo distribution company outside of Madrid. "The newborns ... haven't built up any natural defenses, and drink only their mothers' milk — we don't give them any vitamins or artificial hormones." 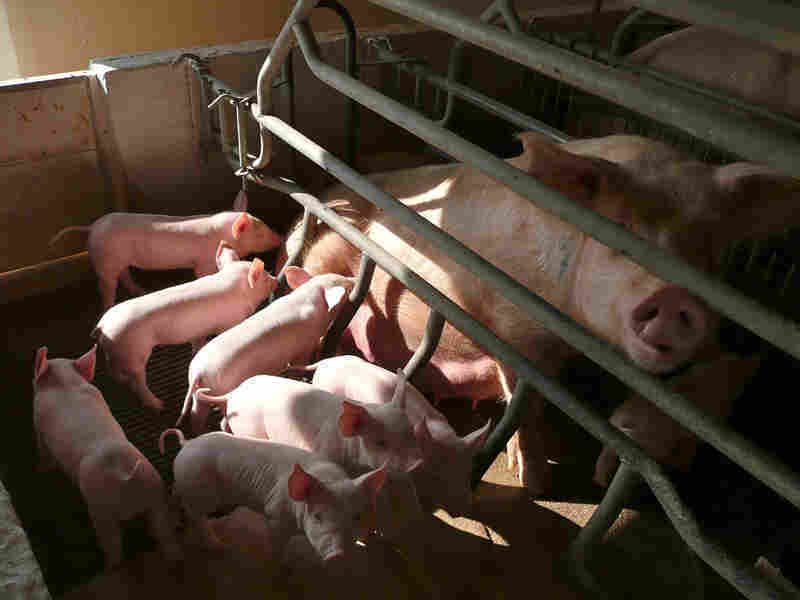 The piglets are slaughtered when they still weigh less than 10 pounds. One cochinillo usually feeds four people. Piglets nurse with their mother at a farm about 60 miles north of Madrid. The pigs will slaughtered and transported to restaurants the city to be served as cochinillo asado. "Once the piglets are killed, we truck them to restaurants immediately — so you're eating an 'organic' pig that was alive at least 24 or 48 hours ago," Manuel says. For that freshness, you'll pay about $30 a plate. You also pay a premium for an early slaughter. After all, if the pigs are raised to adulthood, they gain 10 times their weight, and become valuable for chorizo or charcuterie. So cochinillo is usually a special treat, for a birthday or at Christmastime. And it's usually eaten in restaurants rather than at home, because it requires a huge half-dome, open-faced brick oven. Among the Spanish restaurants most famous for their cochinillo is Restaurante Botín, which dates back to 1725 and claims it's the oldest eatery in Madrid. Before Botín opens at midday, owner José Gonzalez Gozalbo oversees the building of a huge oak wood fire inside the domed brick oven. "It must be local oak, because that's the type of wood that gives you the most heat with the least humidity," he said. "With an open-faced oven, all the humidity escapes during the roasting, and leaves the pig's skin crispy." Customers are often incredulous that cochinillo is pork; the tenderness of its meat evokes duck or moist turkey, sealed by the crispy outer skin. Before it goes in, the piglet is butterflied and rubbed with olive oil, garlic, salt and thyme. It cooks it two stages: once for about an hour in a clay dish alongside the fire or on a grate directly on top of it, and later after it has cooled to brown the skin. Botín's cochinillo made an appearance in Ernest Hemingway's The Sun Also Rises. The American writer loved the dish, and had his own table at Botín, just around the corner from the kitchen. Literary references to cochinillo go even further back. When Don Quixote and Sancho Panza famously stumbled upon a wedding in the Castilian countryside, the first thing they saw was a dozen suckling pigs, sizzling over an oak wood fire. That scene in Don Quixote, written by Cervantes 400 years ago, describes a culinary tradition that had already dominated central Spain for centuries. Cochinillo also spread through the Spanish empire — from Puerto Rico to Cuba to the Philippines. Former colonies like Mexico and Cuba have similar national dishes today. Even Brazil has something that resembles cochinillo — porco pururuca — via its colonial ruler, Portugal. Asked whether cochinillo reminds them of food from back home, a group of Brazilian tourists dining at Botín made the connection. "Actually, yes! We have porco pururuca, [and] leitao pururuca. It's the same!" says Fernanda Rezend, between bites of cochinillo. "Delicious! It's gorgeous — very good." A version of this story aired on All Things Considered on Aug. 30, 2013.